Some form of electrical battery seems to be essential for our modern lives. Our increasing reliance on mobile phones, laptops, watches, hand-held calculators – all powered by some form of battery, from the classic square red Every Ready, to the round black and gold Duracell, these small energy cells are somewhere within a few feet of us. They have revolutionised our lives, but they are also a toxic quantity of heavy metals. When dumped in landfill, that concentration of metals translates as a combination of lead, cadmium, nickel hydride and lithium, all leaching into our soil, and ultimately into the whole ecological breathing machine of our planet. 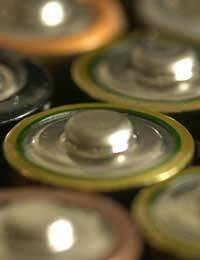 So-called Wet cell batteries are those which are used in cars and other motor vehicles. We are usually only familiar with our car batteries when we have to hook them up to other car batteries to give a charge on cold mornings. Over recent years, improvements in the recycling of these wet cell batteries has greatly improved, largely due to stringent legislation. Casual dumping of these batteries is punished with heavy fines and imprisonment, so we see far few car batteries dumped by the roadside than we used to a few years ago. Most recycling centres now have facilities to safely receive and store car batteries, and many garages will accept them for storage and recycling if they remove and replace one from your car. Extracting the silver or lead from the used car battery is a major financial incentive so there is value for someone in these used cells! A huge crusher breaks down the unit into its various parts, which are then sorted for individual treatment. The plastic is chipped into small pieces, and treated for normal plastic recycling. The lead goes through a melting process, and can then be reused for further batteries, or other lead products, such as guttering. The acid is neutralised and finally, the component of distilled water is purified, and can easily be reused. These are the household batteries used to power all the appliances mentioned above. Despite their widespread and increasing use, for at least the last 30 years, we have been slow at developing technologies and techniques for recycling these batteries. Until recently, there were no battery recycling facilities in the UK – all batteries sent for recycling were shipped to a large plant in France. Figures from the last few years show an annual average of just 2% of disposable batteries were recycled and only 5% of rechargeable batteries. Figures are improving, partly due to facilities being built in the UK, and the ubiquitous legislation, but it is slow. Dry cell battery banks (generally distinctive green cardboard boxes) are appearing in many retail outlets. Look in your local chemist, supermarket, or photographic shop. These boxes accept all small household batteries. Store all used batteries for recycling in a glass bottle, out of the sun or heat, to prevent leakage. Also try your local recycling facility. Many councils now accept batteries in the curbside collection box. Using rechargeable batteries wherever possible is important too.